So you think you know about Mozart? 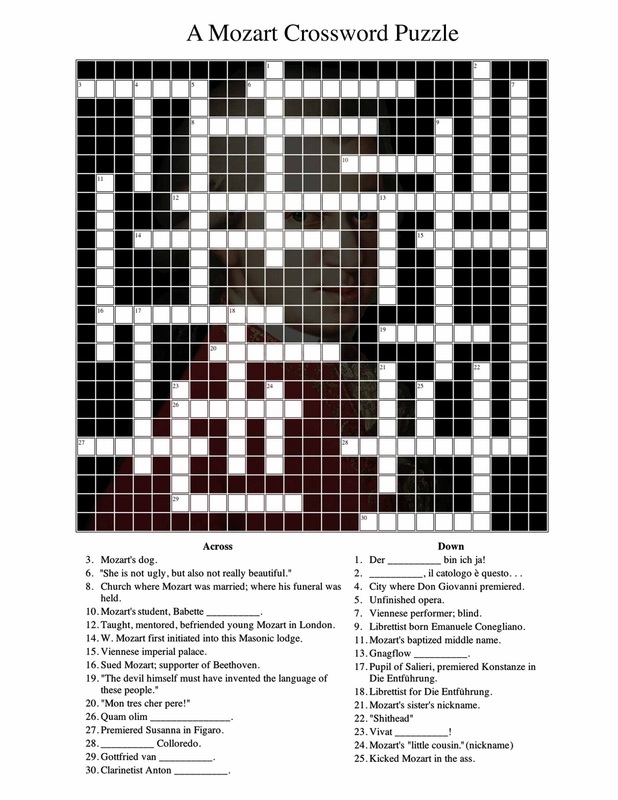 A Mozart Crossword Puzzle. I think I made it moderately difficult. Click to enlarge. It's an 8.5x11 image if you want to print it out. As usual please post any questions, comments, or corrections in the comments section below. Have fun and good luck! Through the years since his death in 1791 the image of Mozart has worn many masks: the traditionalist, the avant-garde, the idiot-savant, the eternal child, the near-autistic, the font of the muses, the bawdy giggler, and so forth. Scholarship has likewise tread many paths through his full, if short, life, with analysis of his music, his finances, his family relations, his travels, teachers, students, pets (a dog and a starling), and on and on. Most of this does in some way shed light on the music and the man. In time and with study a not-fantastical portrait comes together if we ever bear in mind Mozart's humanity, that is, his own failings and the trappings of life which concern us all. Toward that end, this year on the anniversary of the composer's birth I would like to reflect on Mozart as composer, that is, as a working composer, and an extraordinarily busy and prolific one at that. One who was inseparable from music from his first tinkling at the keyboard to his last days dictating the Requiem. Even a cursory glance at the catalog of Mozart's works should give one the proper sense of not just the musicality, not just the creative musicality, but the continuous creative musicality of Mozart's entire life. From the heedless hours of musical play with his father and sister in their parlor, to the improvising, performing, and composing during the European tours of his youth, through his maturity in Salzburg composing for the court, to his professional solo career in Vienna which lasted until his death, Mozart wrote and performed music. We will only in passing mention the obvious, that his music is both voluminous and ingenious. For so prolific a man, and for a composer who died so early, Mozart left behind a proportion of second-rate work which his worst enemies could not call disgraceful. His magnificent integrity as an artist has not been duly recognized as a virtue; it has been regarded as heaven-sent. We are inclined to applaud skill, in games as in art, which shows no apparent effort. The 'effortless', the 'inborn artistry and impeccable taste', are thought to be part of Mozart's genius, reinforced by the standards of an age which had more taste than feeling[. . .] every time he expanded his materials Mozart's perfection was brought about by mental effort. –Arthur Hutchings, in his "Companion to Mozart's Piano Concertos"
We of course struggle to make these observations about Mozart's human limitations because of the transcendent nature of his music. In contrast it is not so hard to see Mozart the figure of history, between two worlds. His European society consisted of a nascent middle class, of a peaking aristocracy, and popular revolutions waiting in the wings. Mozart's Vienna saw the passing of the long reign of Maria Theresa and the liberalizing reforms of her son and successor Joseph II. Musical tastes were shifting from rococo refinement to classical balance and clarity, though here and there still bearing the stamp of baroque complexity. Mozart did not just see these trends as historical, but as life, and that life is to varying degrees and in varying ways in his music. Far harder is it for us to explain, but not harder to feel, where Mozart's music points. We relentlessly labor asking, "How did anyone, any person down here with us in this messy world, make such perfection and such beauty?" and we are not new or alone in this inquisition. The source of beauty and our reaction to and need for it has prompted the inquiries of philosophers for thousands of years. Plato thought the poet was inspired by the muses. How else could the composer of such a sublime piece as the paean ode, Plato asked, not ever have written anything else of worth if the skill was truly his? How would Plato have reacted to the existence of Mozart and his music? Perhaps he simply would have thought Mozart very inspired. We happy moderns of course have scant recourse to Plato's argument, but we further deny ourselves understanding of Mozart and his music by neglecting to take up or develop any concept of beauty. Beauty as something necessary, as something itself a good, something revealing yet mysterious, something within creative and perceptive reach yet ever, ever pointing to some greater realm. When we see beauty as the proper end for art, and not self-expression, self-discovery, self-identification, self-aggrandizement, self-promotion, and self-satisfaction, it might seem less impossible that the greatest composer in the world, a tireless worker and constant student, in an age that valued beauty, might make something beautiful. Perhaps it is the 19th century rise of the Composer and the prettification of beauty that distances us. Maybe it is Mozart's gentility that does not seize the obvious, obdurate modern. Mozart's music in its tender vigor does not seize but rather invites. Let us simply listen. Quia fecit mihi magna, qui potens est. One of the most brilliant and bafflingly simple moments of music and an example of Bach's oft-cited "one-part" counterpoint, this is a priceless gem. Yes it is a masculine moment for the Magnificat, but has any other piece ever so captured the personal element of the Christian faith? Has one ever felt so guided, so gently rocked, so nestled, has the world and beyond ever seemed so ordered, so prepared, has all ever seemed so firm as in these thirty four bars? And has one ever then been so grateful? Would you sing it on a float? Would you sing it in a theater? Would you sing it in a meter? Would you sing it with vibrato? Would you sing it all staccato? Is it sung with bounds and leaps? Is it sung in mumbles and peeps? Is the song most long and gangly? Is it short and jingly jangly? Do you play it on guitar? Do you play it with scitar? Does it make you swing and dance? Does it make you nod and prance? that makes me shirk and turn and pause. Just where all things should be serene. These things blare and distract me. 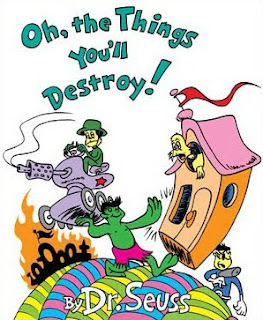 They clash and clang and bash and bang. They chatter and spatter and clatter and shatter. They shatter the staid and somber zone. And I tell you now they're annoying me! Just don't sing these things at mass. "In what music shall we bask? Then what at mass will there be?" The music we need has been passed down! Passed down has been this flowing gold. You can sing it sans soprano. It matters not if ye sing with grace. You'll find none else with this decorum. It fits with others or alone. This music's called chant and the church is its place. Chant with love and chant with rigor. And chant the hours as they pass. Chant the year from start to end. The best for the future is the best from the past.